Yesterday, as I was surfing the net I came across a Czech pastry shop website. On a main page was a picture of Kolache. 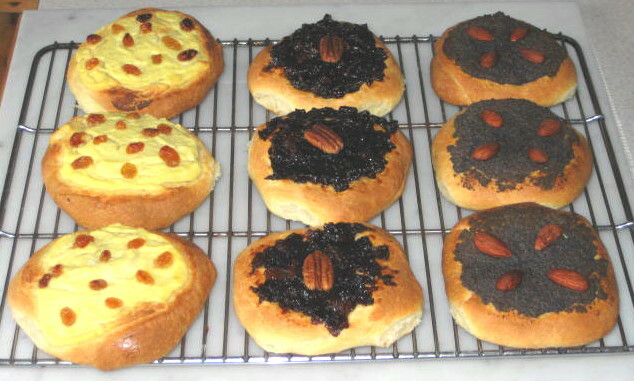 It is almost impossible to translate the word kolache, it is original Czech word. It is basically round pastry pie topped with various toppings; cottage cheese, poppy seeds and prune jam being the three most favorite fillings. When I saw the picture I actually could smell it! I had to make some for Marjo, she never had these. The dough is a bit sweet and super light and similar to brioche but not as rich. Same night I made the fillings and first thing in morning next day I made the dough and in afternoon I baked nice 9 pies, 3 of each. So good, that it is now on my permanent to bake list. Top picture shows (left to right) poppy seed filling with almonds, cottage or ricotta cheese with raisins and plum jam with pecan. Place flour in a large bowl. Make a depression in the center. Add sugar, salt and yeast and mix. In another bowl add warm milk, eggs and melted butter and beat till well combined. Pour the wet ingredients into flour mix and knead until smooth. Or, put all ingredients in a food processor and run till dough clears the sides of bowl (my option). Shape the dough into a ball, place in warm greased bowl and let rise for about an hour or till doubled in size. Divide or pinch a dough just little bit bigger then egg, shape into a ball and place on buttered cookie sheet, flatten to about 3/8” thick and cover with towel. Let rise 10 minutes. Indent center of each pie leaving a rim about 1/2” wide and top center with filling. Brush edges lightly with melted butter and bake for about 25 – 30 minutes. When golden brown remove from oven and place on cooling rack to cool. Brush rim with butter while kolaches are still hot. Mix together well so it is spreadable. In a saucepan, bring milk to simmer, add butter and poppy seeds. Slowly simmer till milk is absorbed. Let cool before using. 1 c. dried pitted prunes, chopped. Simmer prunes in 1/4 cup of water till soft. Add 1/4 teaspoon cinnamon and mix well. Let cool before using.